Narrows Escape, nestled deep in Sunshine Coast Hinterland rainforest. 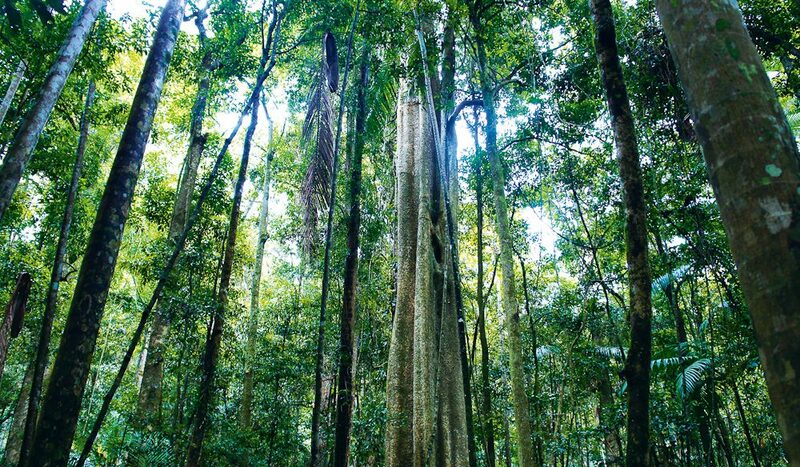 As part of this restorative new Sunshine Coast guided walk, Megan Arkinstall explores the depths of the rainforest by foot and reviews each day from the deck of a luxury rainforest pavilion. The crunch of leaves and rocky earth beneath our feet is all I hear, interrupted occasionally by gleeful birdsong. I take deep breaths of mountain-fresh air to clean out my city lungs. The sound of another pair of feet coming towards us startles me. Quick hellos are exchanged with the lone bushwalker as our paths cross, and we continue deeper into the green oasis. In the entire time we spend walking through this lush landscape, we come across less than a handful of people traversing the same track; the peacefulness is profound. Just 40 minutes west of the well-trodden Sunshine Coast you can have this little patch of heaven almost all to yourself. 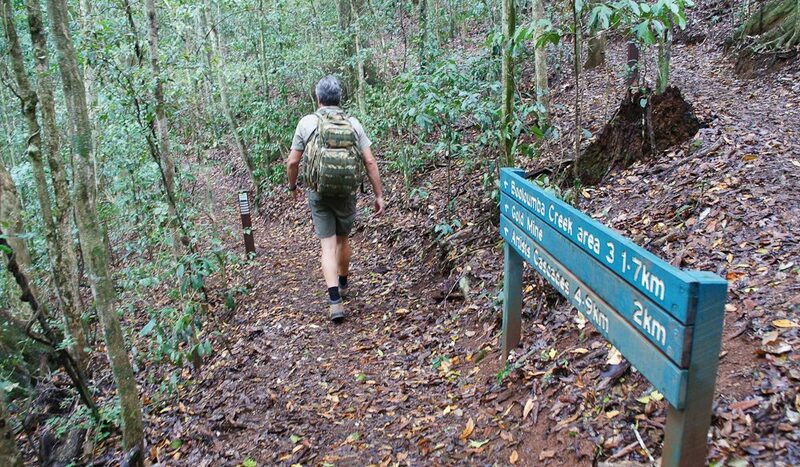 Within the subtropical terrain of the Sunshine Coast Hinterland there are many marked walking tracks; from 800-metre circuits to longer multi-day treks like the Conondale Range Great Walk (56 kilometres) and Sunshine Coast Hinterland Great Walk (58 kilometres). 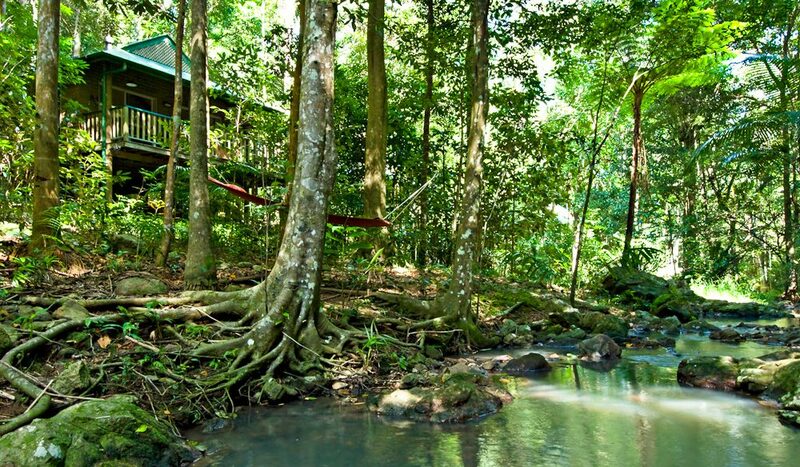 For the adventurous, it can take up to six days to complete the longer walks, staying at camp sites along the way, but for the non-campers among us, Narrows Escape Rainforest Retreat (owned by husband-and-wife-team Mark and Jo Skinner) in the small Hinterland town of Montville offers an enticing option. 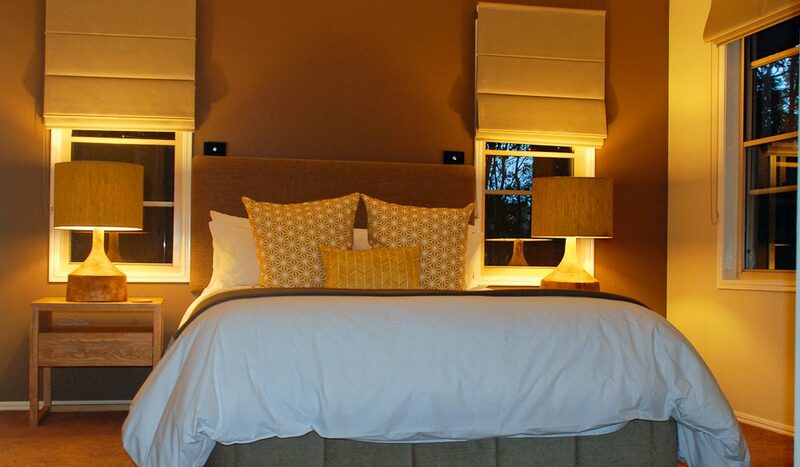 Its brand new Luxe Trekking three-day package combines the best of both worlds: 18 kilometres of the two aforementioned ‘Great Walk’ tracks over two days, and a cushy bed with fresh sheets, a log fire and spa bath in a cosy – and newly refurbished – rainforest pavilion each night. Delicious breakfast provisions, such as freshly baked croissants with homemade jam, set you up for energetic days; and a gourmet barbecue hamper is ready for you to sizzle on your private verandah overlooking the leafy surroundings on your first night. The tracks sit at an average elevation of 450 metres, which means you’ll experience a much cooler climate than the lower-lying coastal areas. Intermittent rainfall contributes to comfortable walking temperatures – which you’ll appreciate when tackling some steep inclines and staircases – but it does mean you need to carry light wet-weather gear. A glistening, lush-green landscape is among rain’s other rewards with the tracks often leading to rockpools, waterfalls and deep water-carved gullies. In fact, every turn is an exercise in anticipation. On our half-day expedition of the Conondale Range Great Walk, we spot the intruiging Strangler Cairn artwork, by Scottish artist Andy Goldsworthy, built with the intention that people would simply stumble across it. More than a beach: Have you heard of Noosa’s other side? 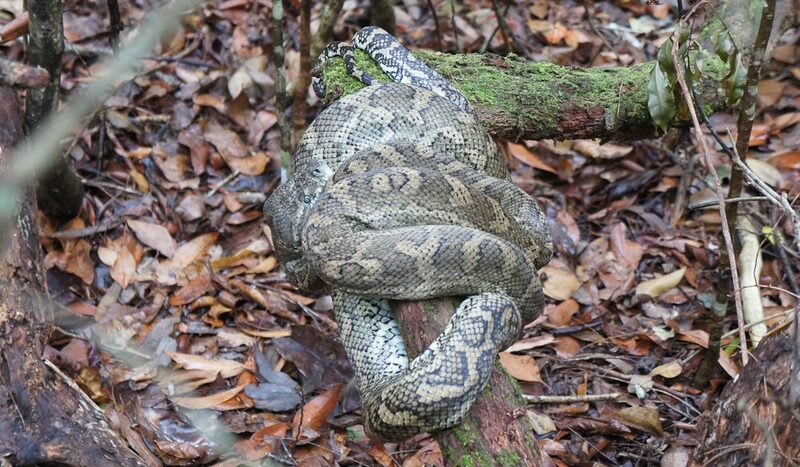 We pass a large python coiled into itself, soaking up the streams of sunlight breaking through the canopy and spot bouncing pademelons. And, when I energetically power on ahead of our guide, I am stunned by a bright-green tree snake lying across the path. It raises its head at me before quickly slithering back into the undergrowth; and I quickly take my place again, behind our guide. Most significantly, the birdlife in this region is prolific. The Sunshine Coast has close to 350 bird species, which equates to almost a third of the nation’s count – greater than the number found in Kakadu, which is renowned worldwide for its bird-watching. We identify the call of a whipbird: the male species summons his mate with one whistle, which is returned by the female, if she is interested that is, with two; and the bowerbird, which sounds eerily similar to a crying baby. Although it’s easy to follow the tracks on your own, a guide is provided with the Narrows Escape package, and that’s an invaluable inclusion. Our guide, Pete from Offbeat Eco Tours, clues us in on the history of the region; warns us of hazards and helps us to spot the wildlife camouflaged in the greenery. He also makes a mean damper. In fact, on this luxe walking package, you can forget squished sandwiches and concentrated juice poppers. It’s more of a delicious-picnic-hamper-complete-with-sparkling-wine kind of experience; all part of the Narrows Retreat package. In your downtime, you can discover the nuances of the Hinterland towns where Tudor, Irish, English, Bavarian and Swiss architecture blends with twee Australiana and country charm. We walk down the main street of Montville where stores sell hand-blown glass and cuckoo clocks; we browse the art galleries and sample the goods at lolly shops and chocolatiers. You can also take in the bohemian vibe of Maleny where organic eateries and natural healing centres are front and centre among fromageries, bookshops and antique stores. If you’re going for all-out indulgence your gracious Narrows host can arrange a delectable degustation at the hill-top Flame Hill Vineyard and Restaurant; a two-hatted fine dining experience at Spicers Clovelly retreat’s The Long Apron; or an exquisite treatment to soothe weary muscles at Spicers Tamarind’s Spa Anise. When I quizzed my host about the dress code for the finer restaurants – I’d only packed my walking gear and a few casual outfits – I was told: “Things are pretty relaxed up here, anything goes really”. One thing locals are not relaxed about, though, is environmental preservation. Upon entering each section of the walk there is a sign: Take only photographs, leave only footprints. The tracks blend into the natural environment and have few rails, boardwalks or constructed steps. But this is what makes these trails so majestic. It’s all a reminder that the ancient rainforest is living and breathing. As you walk on its green-carpeted floor, you may leave only footprints, but you will take away much more than photographs: you’ll leave feeling invigorated, with a sense of calm, and ever so slightly indulged, too. 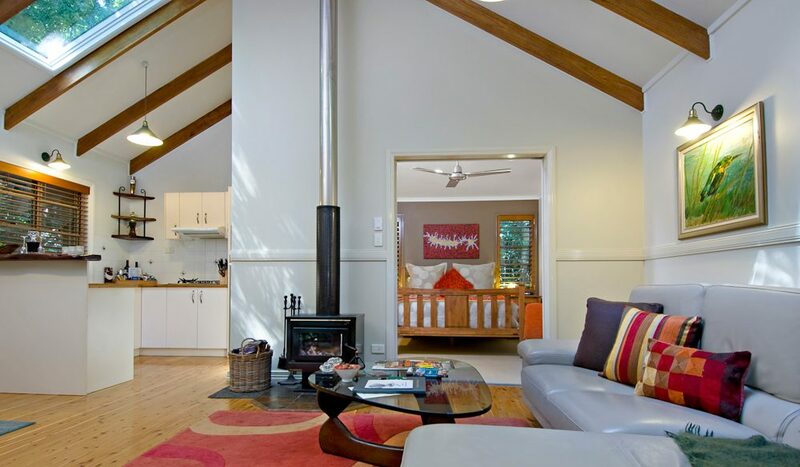 Getting there: Narrows Escape Rainforest Retreat is located in Montville. Transfers from Brisbane, Sunshine Coast and Gold Coast airports are available on request. Costs: $1350 per couple for the Luxe Trekking three-day package, including two nights’ accommodation, a fully guided walk on day two and three, and all meals. Need to know: You can add on spa treatments and upgrade to degustation and two-hatted dining experiences.